Directory services are at the core of just about every network. Whether you formally have a solution, or you are manually managing user access to IT resources, you have what’s known in the IT industry as a directory. For most organizations, the directory service is an on-premises solution that connects users to IT resources. Who is the market share leader in on-premises directory services? If you guessed Microsoft Active Directory, then you are right. As more IT organizations are shifting their organizations to the cloud, a new category of virtual directory services solutions is emerging. While AD may be the current market share leader, IT admins are struggling with connecting and managing all of their IT resources. AD excels in one particular use case: an all Microsoft Windows network located behind the firewall. However, a homogenous IT landscape is outdated nowadays. As more of an IT network shifts to the cloud and to different platforms, Active Directory is able to manage less of the network. As a result, IT organizations end up jumping through hoops to seamlessly connect their users to all of their IT resources. While Mac and Linux devices require directory extension technology, Web applications necessitate the purchase of a web app single sign-on solution. Additionally, if the organization wants to step-up security with multi-factor authentication, then yet another solution is required. As the world moves to the cloud, Active Directory is less valuable. A virtual directory service is a new concept. Often referred to as Directory-as-a-Service® technology, the cloud-based directory service is meant to provide a vendor independent, multi-protocol solution. This next generation Identity-as-a-Service platform works seamlessly with Windows, Mac, and Linux devices. It enables users to connect to on-prem applications through LDAP or web applications via SAML – all with the same set of secure credentials. Infrastructure-as-a-Service providers, such as AWS and Google Compute Engine, are easily integrated into the central, virtual directory service. Google Apps identities can be centrally managed and provisioned from DaaS. Further, even WiFi access can be controlled through the central identities stored in the hosted directory service. 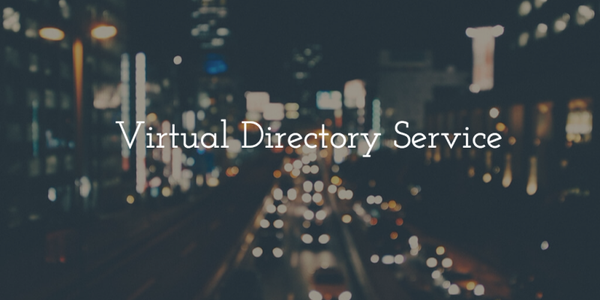 A virtual directory service offers significant benefits to organizations. Instead of maintaining more infrastructure on-premises, a cloud-based directory service enables organizations to move to the cloud. A single identity can be leveraged throughout an organization’s infrastructure whether on-prem or in the cloud. Also, a third-party provider is responsible for all of the installation, configuration, scaling, high availability, security, and ongoing maintenance, thus freeing up IT to focus on other important priorities. If you would like to learn more about how a virtual directory service can support your identity management plans, drop us a note. We’d be happy to help discuss the benefits of Directory-as-a-Service. Alternatively, if you would like to see the technology in action, sign-up for a free JumpCloud DaaS account. Your first 10 users are free forever.